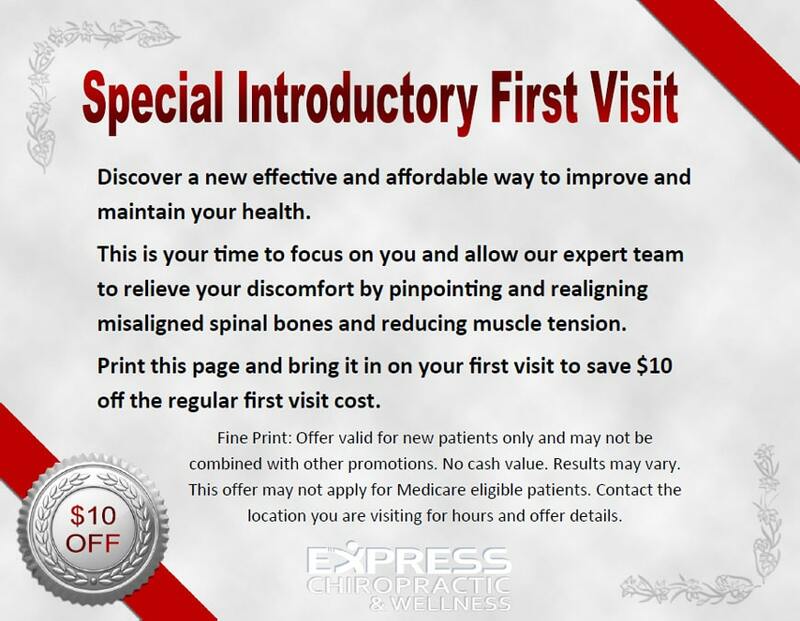 If this is your first visit to an Express Chiropractic location or your first time to visit a chiropractor altogether, you may be unsure about what to expect. The doctor will make sure you are a good candidate for an Express Chiropractic office by first listening to any symptoms or conditions you are experiencing followed by an evaluation of your spine. Any subluxated vertebrae – spinal bones that have lost proper motion or alignment – will be explained and then adjusted to help remove any pressure on the surrounding nerves (which is often what is leading to pain and other symptoms). An adjustment is light to moderate pressure in the area where subluxated spinal bones (or other areas such as ankles and elbows) are found. The adjustment will help restore the proper alignment and motion. Ready to get your spine checked by your Fort Worth Chiropractor? Click the ‘Introductory Special’ link below to save money on your first visit. *New Patient? Please call first to make sure we are still accepting New Patients for the day. We will also try to direct you towards less busy times in the office. If you are going to walk-in please arrive at least 1 hour before closing so that we may ensure there is enough time to see you that day. Once established in our office you can always walk right in. *Offer valid for new patients only and may not be combined with other promotions. No cash value. Results may vary. This offer may not apply for Medicare eligible patients. Contact the location you are visiting for hours and offer details.